We arrived Wednesday in Papeete and moored bow in at the yacht quai downtown. Getting on and off the boat over the bow pulpit is a challenge, as we keep the boat tied well away from the float, to avoid snagging the bow roller and anchor on the big steel float. The harbor is well developed with freighters, inter-island ferries, cruise ships, navy boats, yachts and the occasional pirogue. It's much nicer than we were led to expect. We're next to some Irish friends, so that's better yet. There's some traffic onshore, but it's not too bad. The harbor is quite sheltered from the tradewinds, so it's quite warm when the sun is out. The compact downtown is a busy place with all kinds of shopping: a wonderful fruits, veggies, fish, meat, pastries, flowers, crafts, and clothing market, boutiques, small parks, churches, and a well developed waterfront. Although it's known to be very expensive, I found plenty of reasonably priced items. Sometimes, too, our definition of expensive changes as well. Bill is scouting around for boat and outboard parts. People are very pleasant and friendly. The weather is a little rainy. We are here mainly for the Tahiti-Moorea Rendezvous. Tonight was the opening ceremony at the Mairie (city hall). 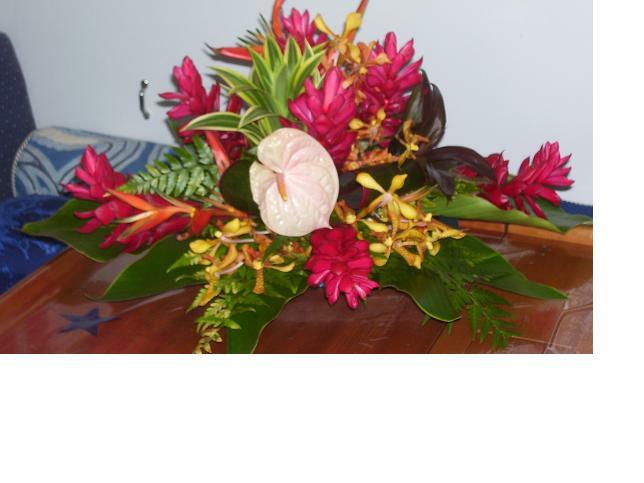 We all received fragrant leis, fantastic tahitian dancing and light buffet of canapes and pastries. Tomorrow we all sail for Moorea.